The 16-foot boot outside the Vactor Ranch development on Sabino Canyon Road once advertised The Tack Room, a five-star restaurant. Some boots were made for walking, but there is one that serves as a Tucson landmark. 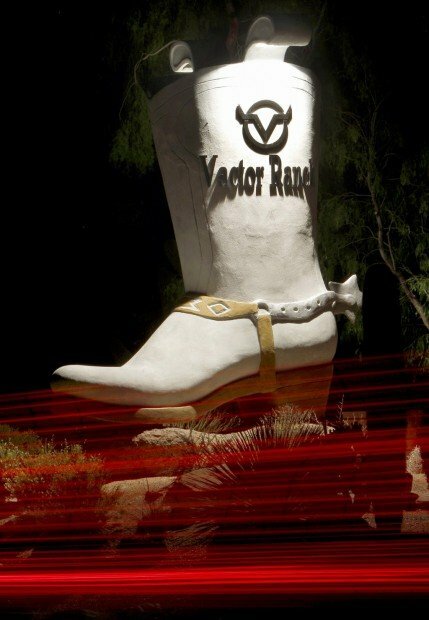 The 16-foot-tall boot that sits on the east side of Sabino Canyon Road, north of Tanque Verde Road, started out as a sign for Tucson's first five-star restaurant, The Tack Room, and now identifies the gated community known as Vactor Ranch. The Tack Room was originally a private home, which was sold to a group of investors - including the Vactor family. In 1946 it was developed into a guest ranch called Rancho Del Rio, and became a restaurant in 1965. Drew Vactor grew up working at the ranch. After college, he interviewed with his father to run the restaurant. "He offered me the job with half the pay and twice the hours. ... There was an offer I couldn't refuse," Vactor recalls. When Vactor started managing The Tack Room, he decided it needed a new sign. The inspiration for the giant cowboy boot came from the Rancho Del Rio logo, which had a cowboy boot on top of a mountain. Vactor decided to keep with the theme of the ranch and chose the boot, which was commissioned in 1976 and created by artist Michael Kautza. Kautza is also known for the wine bottle in front of the Boondocks Lounge on North First Avenue. Kautza built the framework in two pieces in his yard because it would be too big to transport in one piece. He then pieced the sculpture together onsite and did the concrete and lettering. The inside remained hollow. The boot is not in its original location, which is where the northbound lanes of Sabino Canyon Road are currently located. In 1983, Sabino Canyon Road was being widened, so the boot had to be moved 40 feet east and 40 feet north, which was no easy task. It had to be jacked up, placed on roller bars and railroad tracks to arrive at its current destination. The cost to move it was about twice the amount to create it, according to Vactor. Vactor retired from the restaurant business and leased The Tack Room to Bob McMahon of Metro Restaurants in 2000. The Tack Room was open for 38 years before it closed in May 2003. In October of 2005, old fixtures from the restaurant were auctioned to benefit Habitat for Humanity, and the building was eventually torn down to make room for houses. The boot, however, had to stay put, according to Vactor. He said when the property was rezoned as a residential area, part of the agreement was that the boot would stay. When residents were asked for input, many had the same request - "to keep the boot there. It's a local landmark." Even though Vactor never second-guessed his decision to leave the famed restaurant, he said, "I do feel personal pride in the fact that I was responsible for the boot being there and that the neighbors, for the most part, like it so much they wanted it to be protected and remain in place." Contact reporter Angela Pittenger at apitteng@azstarnet.com or 573-4203.